Unfortunately this is becoming a regular theme. Rex goes off fishing in some beautiful stream, blanks yet again, gets mocked by his wife and writes a story on where not to fish. You must be thinking that I’m a pretty hopeless fisherman. If you are, well you not alone, my wife chirps me non-stop. I’m wondering if I am a worthy contributor to “Feathers”, after all you guys want to read about the fish we catch and how we do it. In my defense, it’s not a great time to be a small stream enthusiast in Natal at the moment. The drought has seriously thinned out the fish populations, but they should recover soon as the river levels are looking really good. One thing I will continue to do, is share beautiful pictures of the streams that I explore. Judging by my recent success, I may as well write about where you shouldn’t go fishing. Fish or no fish, its great fun exploring these special streams! All I wanted to do this weekend was to catch a fish, just one and bring it home to cook for Jen (after throwing it at her first for all her mocking). I have to agree with Jenny that technically speaking fishing means catching fish and so what I do must be something else. If its not fishing then what is it? Mediation came to my mind this weekend. What better way to describe my hobby. Its the best way to unwind and completely zone out and forget about everything else. Not that my life’s is so stressful that I need meditation, but its good to zone out none the less. I won’t bore you guys with the details of the my last three fishing trips, but I will share some photos. I have fished in three incredibly beautiful places but have only one 6″ fish to show for it. So if its fish that you after then take this post as a guide of where not to fish. 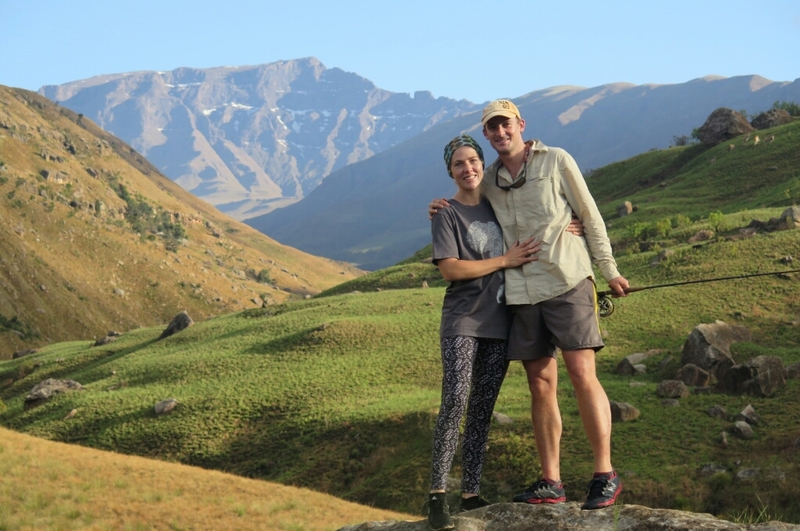 This weekend we spent a family weekend at Lotheni Nature Reserve in the Southern Drakensberg. It’s somewhere I have hiked through twice, many years back, but I’ve never stayed in the chalets. 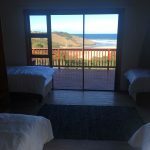 I can’t believe I’ve never stayed there before, as its an absolute gem of a place. This was actually a family getaway for grandparents and uncles and aunties. It also happened to be my little ones first birthday. What a place to celebrate your birthday. I did sneak in some exploring and a bit of fishing, with no luck of course. 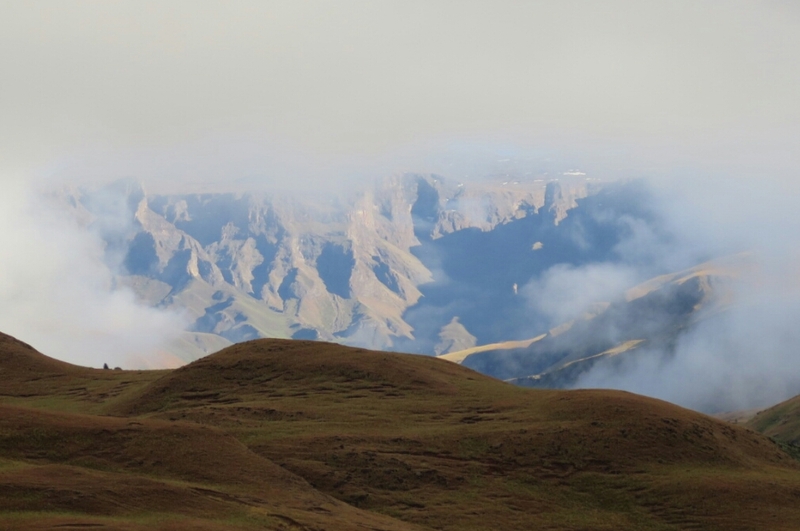 Lotheni is definitely going to be more frequently visited by our family in the future. So what about the fishing? Well, pretty much the same as the last time. 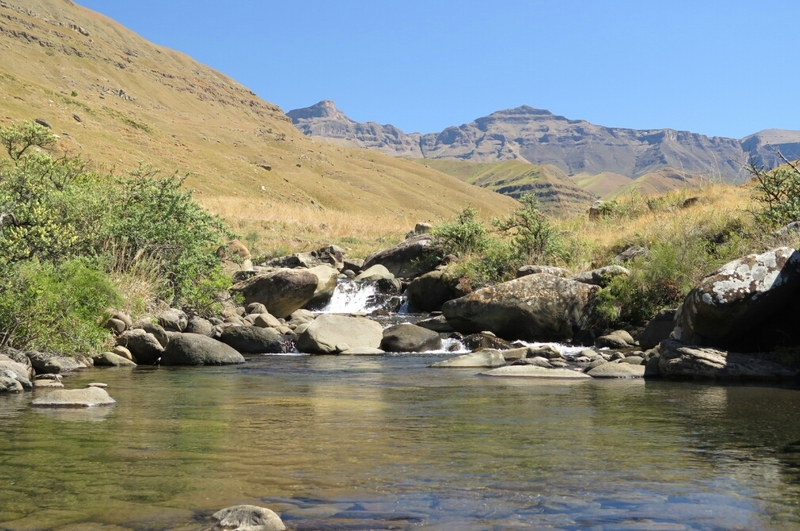 Absolutely gorgeous water, but Lotheni’s Brown trout were nowhere to be seen, at least in the areas I focused on. I spent a few hours fishing the section around Cool Pools, where I rose a decent fish which I missed (probably meditating too hard) and had one tiddler splash at my fly. Other than that, it was just casting practice, and lots of meditation. 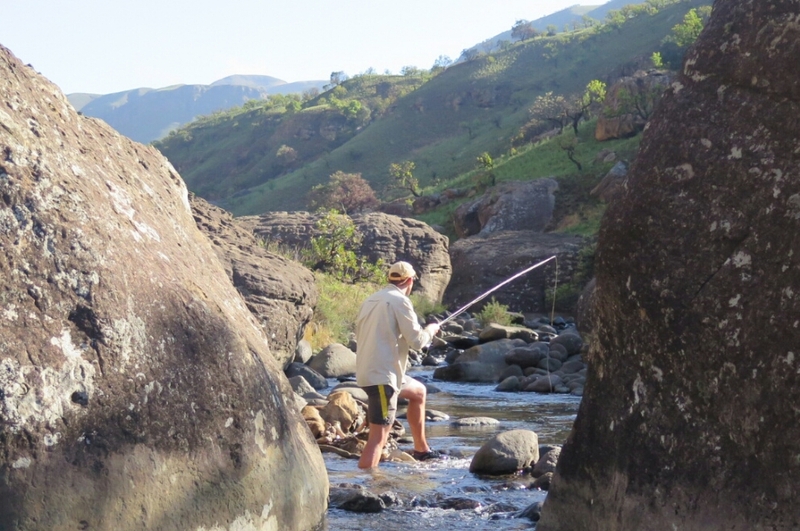 On Saturday morning I fished hard for a few hours up the Left hand fork of the Lotheni River that comes in from the west. I fished a few km above Simes Cottage while the family picnicked on the rivers edge. It was the most beautiful water, where I would expect to find a fish in every pocket, but I didn’t even spook a fish. The Lower section just below Cool Pools where I did see a fish. 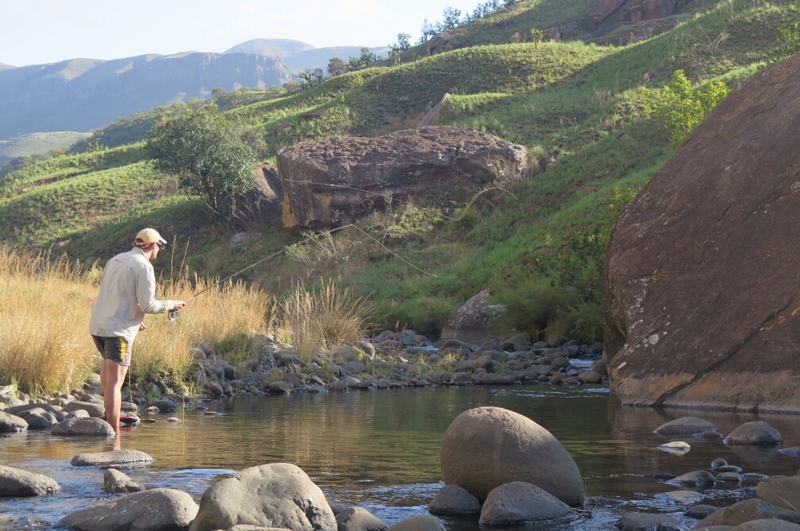 Fishing up the west fork of the Lotheni River. Olli fast asleep while hiking up to our picnic spot on the upper Lotheni River. 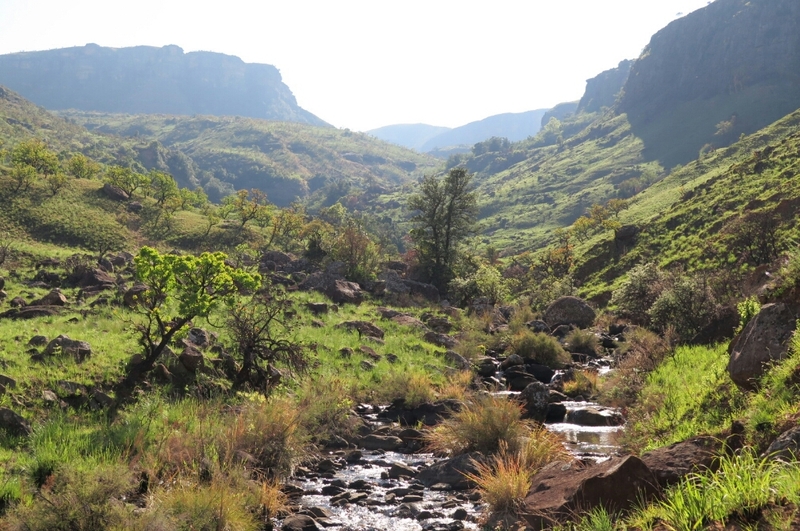 This morning Jenny and I went for an early hike up the Northern fork of the Lotheni river, which according google maps, is called the Elandshoek River. We walked about 4 or 5 km upstream of the main confluence. This was even better looking water than the left branch! I fished hard for a few hours before we had to head back to be there when Granny arrived. Here again, I didn’t even see a fish. If there were Rainbows in the river, I would have expected to be hooking them in every pocket. 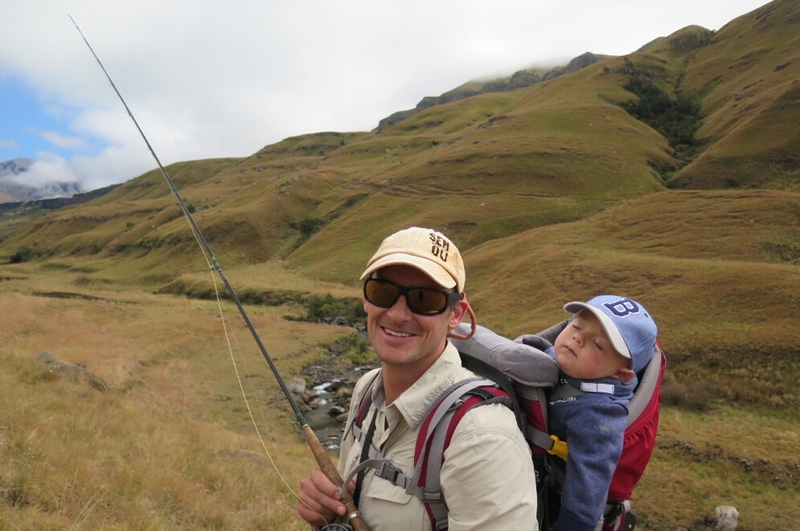 It seems like that both the Lotheni and the Mkomazi Brown trout have been severely thinned out by the drought, but I have no previous reference other than from other anglers. Both rivers seem to have a few fish lower down, but in both rivers, I saw nothing higher upstream, where the water actually looked better. Anyone wanting to go and fish those rivers, and who actually wants to catch something, then focus on the lower reaches. Maybe its even worth going down into the tribal lands where there is more holding water. It wasn’t for a lack of flow, the rivers were flowing at a perfect level, its just that there seem to be bugger all fish higher up. But then we are talking about those sneaky things called Brown Trout which can appear out of nowhere and then disappear again leaving the river looking devoid of fish. A gorgeous tributary coming in from the north east. This must also hold fish, at least in the good years. My photographer and meditation Buddy. I don’t always fish in my trail running shoes, but we did a fair bit of running in the morning to get up the valley, and then back out again. This is where we turned back. I was champing at the bit to keep on going. I’m sure there is still a good 5 km + of water upstream of this point which should hold fish. 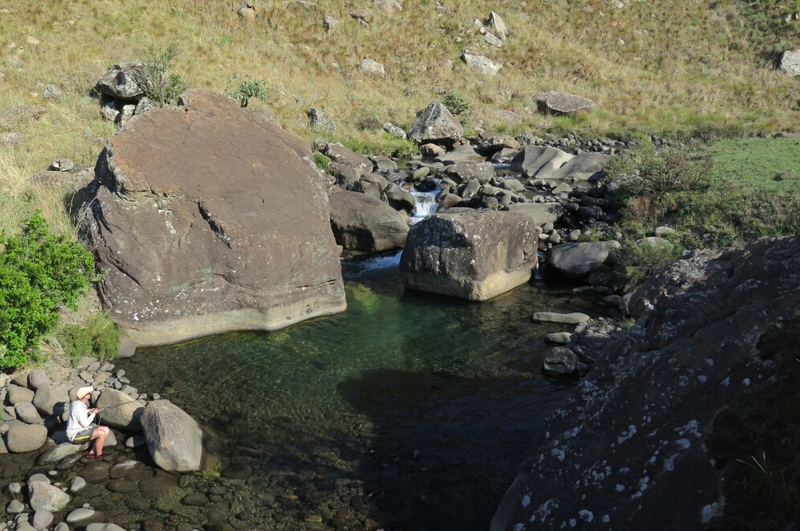 A typical pool higher up the Elandshoek River. 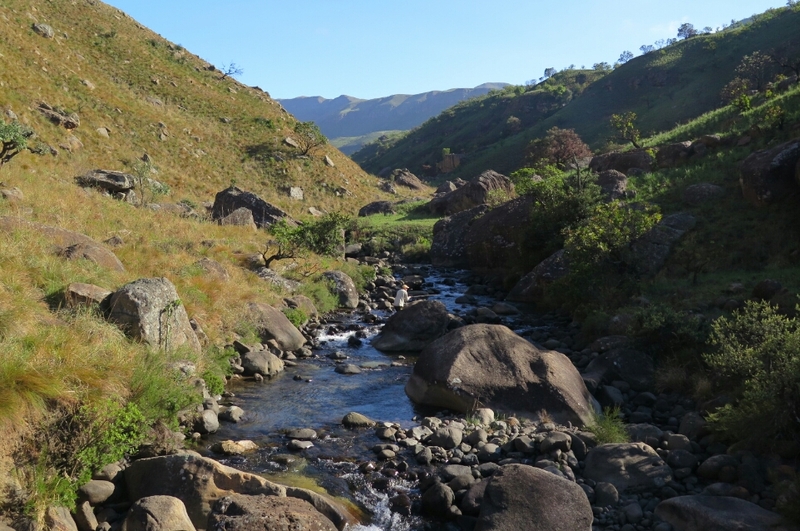 As you go higher up the Elandshoek River, the river bed becomes strewn with big boulders which make for some great holding water. 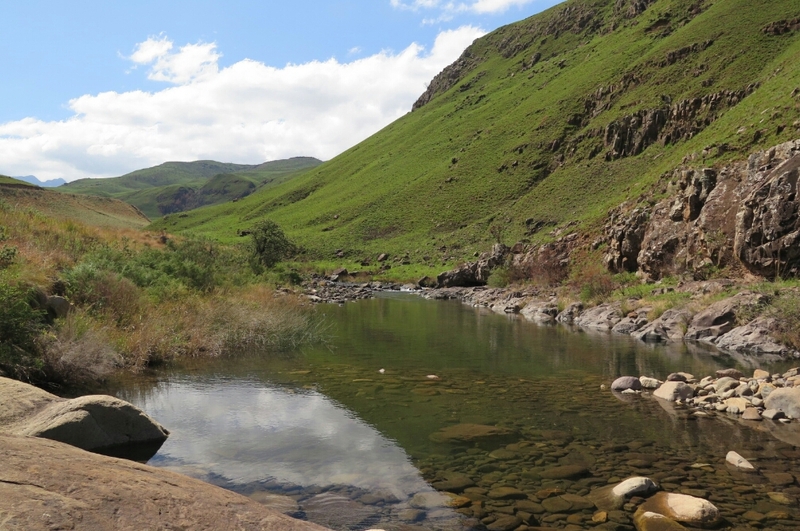 A perfect pool, high up the Elandshoek River. 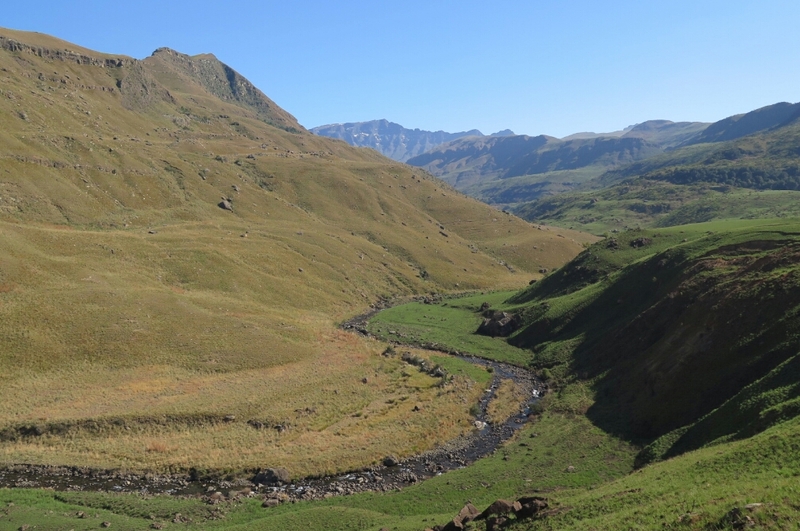 Looking back up the Elandshoek River which drains the southern slopes of Giants Castle. I think that on some maps this is the Lotheni River. Looking down into the Tsoelike Gorge from the village of Ha Monyane, near Ramastelisos Border Gate. This was where we left our car before the walk into the gorge. Once in the gorge there are very few exit routs. The river was terribly low, and these sections where I would have expected to be pulling fish out of every pocket, were merely rocks with a trickle flowing between them. Maybe I had a few more takes that I missed, but forgive me for not being able to concentrate on the fishing when these majestic cliffs are towering around you. My fishing buddy for the day, Andrew Descroizilles managed 3 tiddlers and one decent fish. I however only managed a single fish of about 6″. The only decent fish of the day. Andrew caught this while I was giving him a few casting lessons. Well, he seemed to do quite ok without my help after that and I was the one who struggled. In December last year I caught dozens of fish of this size about 10km upstream from where we were. They seem to have vanished since then. A very unusual rock formation where the narrow ridge has a hole right through it. 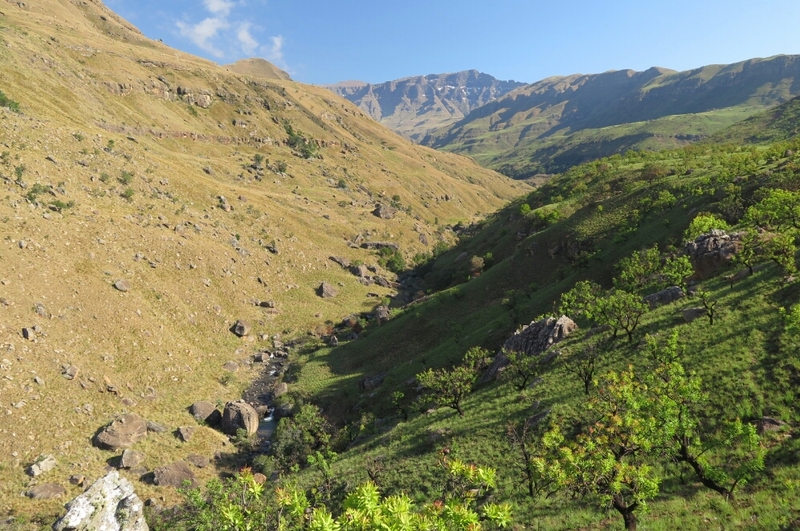 The upper reaches of the Mkhomazi. I spent a day fishing the upper reaches with Miles Divett. We did not even see a fish up there. Graeme Steart stayed lower down near the camp and managed to get 4 small Brownies in the 8 to 10″ range. Miles untangling his Sage double ought wt line after a tiny gust of wind. I didn’t know they made rods so light! beautiful feeling rod, but I am definitely not about to rush out an buy such a light rod. A 3 wt is perfect for me for now. This beautiful looking water was devoid of fish, well at least it seemed that way. beautiful country, thank you for the pictures. I last fished the Lotheni in 1988 or so. We stayed in the chalets for a couple of nights after a long backpacking trip. There were nice browns to 12″ or so in the lower reaches around camp, but like you I saw nothing in the higher reaches despite their fishy looks. Lotheni is undoubtedly one of my new favourite places. very special indeed.